TEXAS TECH--Maurice Clarett becomes the first true freshman halfback to start his first game as a Buckeye in the post-war era, and carries the Bucks on his shoulder, rushing for 175 yards and 3 TDs as Ohio wins the final Pigskin Classic. The author attends the game and joins the crowd in chanting "MAURICE, MAURICE!" KENT STATE--The Buckeyes jump out to a 35-0 lead and absolutely annialate the Golden Flashes. Mike Doss and AJ Hawk each return picks for scores. WASHINGTON STATE--Ohio trails 7-3 at halftime, but the Bucks dominate the second half and win 25-7, as Maurice Clarett rushes for 230 yards. CINCINNATI--The Buckeyes survive a huge scare as Gino Guidulgi and his recievers can't connect in the end zone from the 15-yard line with under a minute to play. On fourth down, Will Allen picks it off in the end zone and the Bucks survive. Clarett misses the game with minor knee surgery. INDIANA--The game is close until late in the second quarter, but the Bucks turn it on and send the Hoosiers home in defeat. SAN JOSE STATE--The Spartans expected to be crushed, and were. PENN STATE--Chris Gamble becomes the first Ohioan since Paul Warfield to start both ways, and returns an interception for a touchdown that proves to be the difference in a huge win. 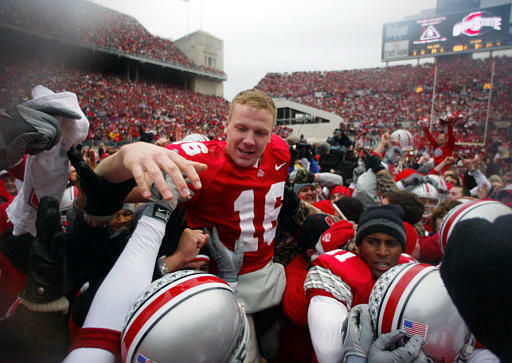 Clarett's shoulder is injured; he will not play again until Michigan. MINNESOTA--A close game at halftime is blown open in the 3rd quarter when Ohio terrorizes the Gophers' punting game. ILLINOIS--OSU and Illinois go back and forth, with Illinois kicking a field goal as time expires to force OT. The Buckeyes get the ball first and Mo Hall goes 8 yards for a TD. The defense holds Illinois and Ohio escapes 12-0 for the first time ever. MIAMI--Ohio is a 13 point dog, but the Bucks force two turnovers to set up touchdown runs by Krenzel and Clarett to lead 14-7 at the half. A bomb to Chris Gamble in the 3rd quarter puts Ohio at first and goal at the 5, but Krenzel throws an interception. However, Clarett runs down the Hurricane DB and strips the football from him at the 35. Nugent's field goal puts Ohio up 17-7. But Willis McGahee goes for a TD and it is 17-14 heading to the fourth. A Will Allen hit destroys McGahee's knee, but as time expires Miami hits a field goal to force OT. Miami quickly scores a Kellen Winslow TD. On 4th and 12, Krenzel hits Jenkins to keep Ohio alive. However, 4th down comes again and Chirs Gamble is interfered with in the end zone as Miami thinks they have won. Krenzel ties the game with a touchdown and a Nugent extra point. Ohio takes the ball in 2nd OT and score with Clarett. Miami's posession results in a 1st and goal at the 2. Jarett Payton is stopped on first down, Ken Dorsey throws incomplete on 2nd, and Quad Hill is stuffed on third. On 4th down, Cie Grant pressures Dorsey, who throws desperately into the end zone where four Bucks see that the ball falls incomplete, and Ohio State wins the National Championship.